In a medium-sized pot combine the chili peppers, juice and vinegar. Bring the mixture to a boil and then reduce the heat. Cover the pot and continue cooking over low heat for 15 minutes. Add the sugar and return to a boil over high heat while stirring continuously. Next, add the pectin and let boil for one more minute. Last, turn off the heat and remove any leftover bubbles with a metal spoon. Immediately pour the cooked chili pepper mixture into sterilized glass jars. Remember to leave at least 1/4 inch of space between the marmalade and the top of each jar. Finally, distribute the chili peppers evenly between the jars before closing and cleaning-up any excess jelly. Boil a generous amount of water in a large pot. Then turn off the heat and transfer the closed jars to the hot water bath. Let sit for five minutes before removing; cool over a wire rack while the marmalade sets. I recommend that you always use gloves while working with spicy peppers. 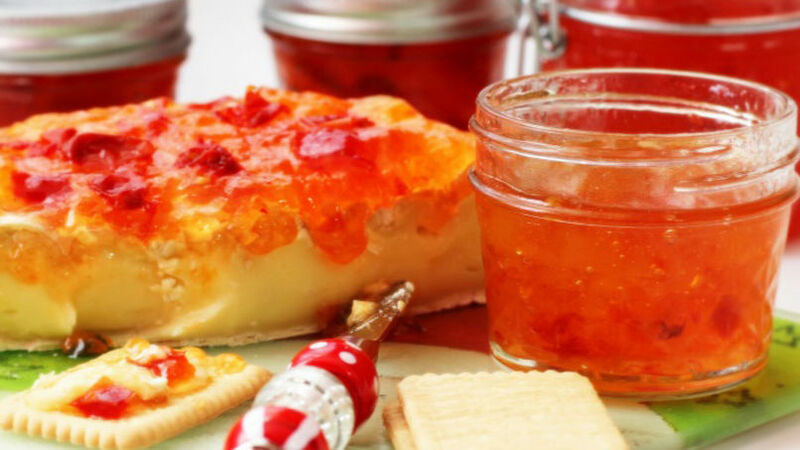 Other types of hot peppers such as jalapeños or habaneros can be used for making this jam. This jelly is perfect for accompanying any kind of creamy cheese such as brie, goat's cheese or regular cream cheese, and can be served with toast, scrambled eggs, sandwiches or crackers. The spicy-sweet combination also pairs well with barbequed meat, such as pork ribs and grilled chicken breasts.